I love Spring Awakening so much that after seeing the eight time Tony winner on Broadway (with most of the original cast), I named the next kitten I adopted Moritz Stiefel, after my favorite character. Nine years and three bladder surgeries later, my sweet Moritz is still with me, and so is my love for Spring Awakening. Surprisingly (or maybe not so surprisingly), the themes of the late 19th Century German play, as seen through a rock musical, are still relevant today. Suicide rates are on the rise, there are some very real threats to abortion rights in this country, exposure and intolerance of sexual abuse and harassment is at an all time high, and 21st Century technology is making it harder to be a teenager than perhaps it's ever been. You think Wendla and Melchi had it rough? At least they never had their most embarrassing moment go viral for the entire world to bully them! 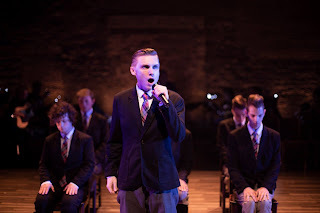 For all of these reasons I'm grateful to Shoot the Glass Theater for bringing Spring Awakening to us now, in a beautifully staged production featuring a super talented cast of young and unknown actors. I found myself falling in love with this story and these characters all over again. 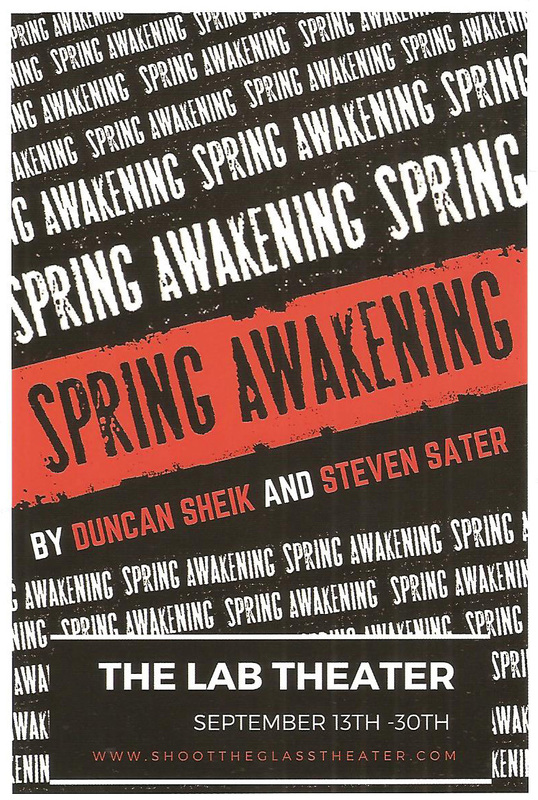 Spring Awakening the musical, written by Steven Sater (book and lyrics) and Duncan Sheik (music), is based on an ahead-of-its-time German play by Frank Wedekind (Frülings Erwachen for my fellow German nerds). It was written in the late 19th century but rarely produced at the time because Wedekind so explicitly and realistically examined the sexual awakening of teenagers in a repressed society. More than 100 years later this ground-breaking play was combined with modern pop and rock music to great the ground-breaking musical. Our heroes are the teenage lovers Melchior and Wendla, and Melchior's best friend Moritz, who don't have the information they need to handle the issues they face, which has dire consequences for all three of them. * Good student and popular kid Melchior thinks he knows everything, while the struggling Moritz is overwhelmed by school work, girls, his feelings, dreams, and life in general. Naive Wendla begs her mother to tell her where babies come from, and by the end of the play her mother wishes she had answered honestly. This trio is surrounded by school chums (separate schools for boys and girls of course), who are all dealing with things that teenagers deal with, but lack the tools to handle them. The thing that most made me want to see this show, besides that it's one of my favorites, is that when I saw the cast photos online I did not recognize a single actor playing the students, and they all looked really young. 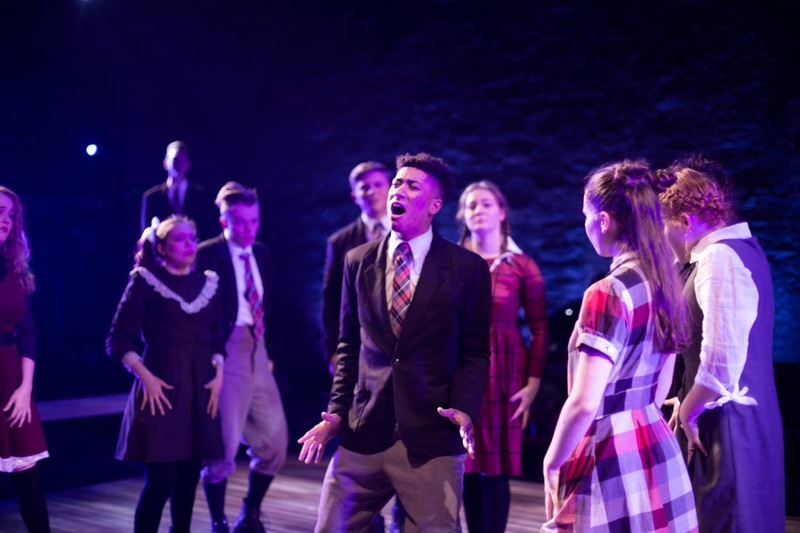 In the same way that the original Broadway production gave us Lea Michele and Jonathan Groff and more, I hope to see more of these dozen kids on #TCTheater stages in the coming years, because every one of them is a star in the making. I can't find any bios so I don't know where director Ryan Nielson found them (they could be high school students or 30-year-olds with great skin care regimens), but he's done a fantastic job with the casting and with bringing out the best in all of them. There's truly not a weak link in this cast, and they all have their moment to shine, and rise to the occasion. 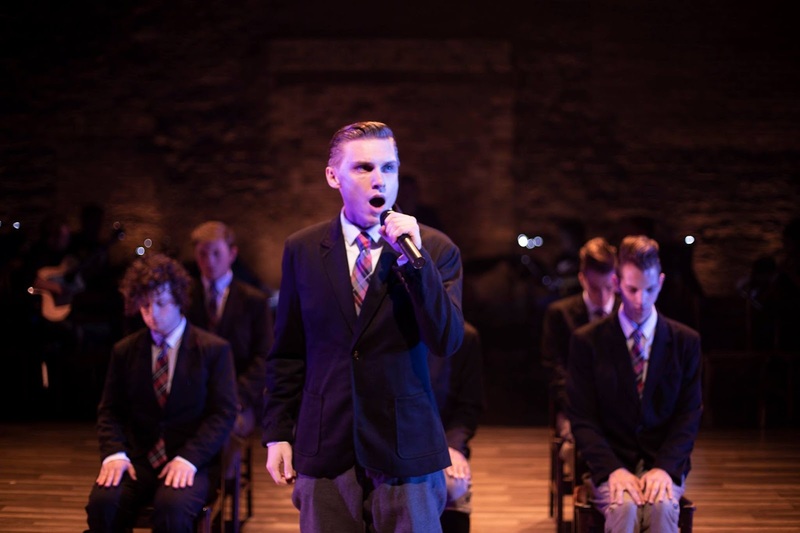 In the lead roles, Dylan Rugh has a Ken Cosgrove-like natural confidence as Melchior, whom all the boys look up to and all the girls crush on. Erica Janey (with more than a slight resemblance to Lea Michele) is lovely as Wendla, vulnerable, curious, and strong. Caleb Michael broke my heart as my poor sweet Moritz, all nerves and confusion and desperation, giving a fantastic performance of my theme song "I Don't Do Sadness," a duet with the also wonderful Ella Dolynchuk as Ilsa. 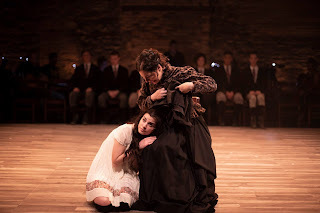 Other highlights in the ensemble (that also includes Alexa Johnson, Amanda Mai, Lexi Johnson, Matthew Hall, and Mitchell Gray) include Mara Currens with a powerful performance of "The Dark I Know Well," Jake McInerney as the smug and smarmy Hänschen, and Maxwell Ward as the sweet and trusting Ernst. Playing multiple adult roles, from caricature to compassionate parent, are the versatile Marci Lucht and John Goodrich. The entire ensemble performs with much passion and great voices, individually and as a chorus. The Lab Theater is a perfect choice for this show, and it's beautifully and sparsely staged within a square in the gorgeous cavernous space. The only set pieces are a row of wooden chairs and four simple benches framing the space and brought into it when necessary. While this production uses similar conventions to past productions (hand-held mics, jumping off chairs, cast coming out in modern clothes for "Purple Summer"), I didn't mind it because they use these iconic moments in fresh ways (although speaking of mics, there were some sound issues at the preview I attended, which I'm certain they will figure out as they get used to the space and equipment). 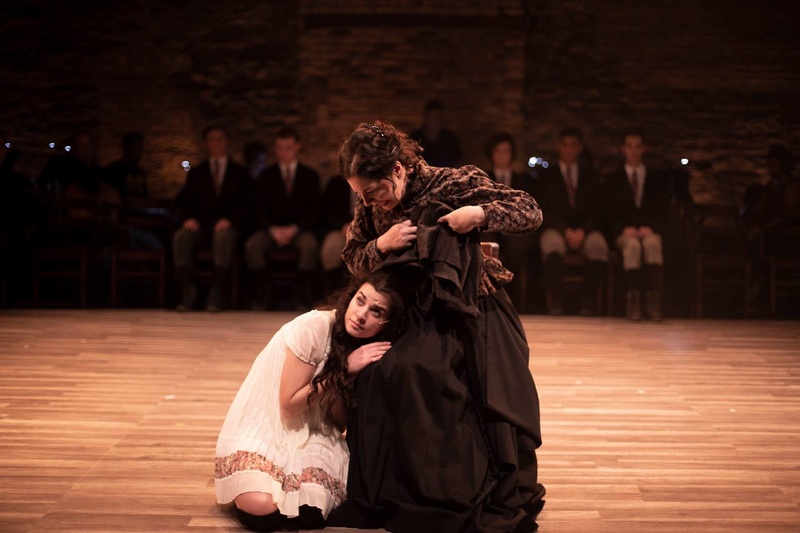 The lighting (designed by Jacob Lee Hofer) creates some dramatic moments that add to the storytelling, as do the cute modern/period costumes in shades of black, white, and red (designed by Rachel Nielson). This is a heavy piece (abortion, suicide, child abuse, oh my!) but there is also humor and a brilliant rockin' score. I love that they didn't skimp on the musicians; the nine-piece orchestra (led by co-music directors Jean Van Heel and Randy Buikema) is placed behind the stage space and sounds gorgeous. The choreography (by Sophie Pimsler and Ryan Nielson) is energetic and edgy, a highlight being the joyfully frenetic "Totally F**cked." 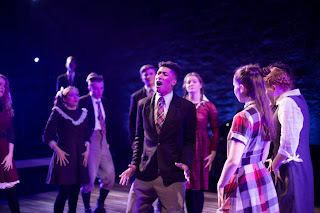 I'll never tire of seeing Spring Awakening, not that it's done a lot. To my knowledge the last local production was Theater Latte Da in 2012. But at a time when it feels so relevant, and a production that's fresh, young, energetic, passionate, intimate, and exciting, it's a must see. 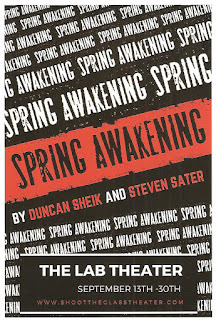 Catch Spring Awakening at the Lab Theater* in Minneapolis' trendy North Loop neighborhood, Thursdays through Sundays through the end of the month. *Plot summary adapted from what I've written about past productions. **Parking can be tricky in that neighborhood, but the Lab has a lot across the street where you can park and pay inside the lobby. Unless you're lucky enough to find street parking, free after 6 and on weekends.